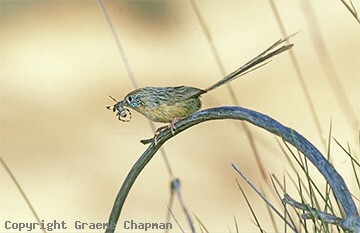 Mallee Emu-wrens have a very restricted distribution in N.W. Victoria and far eastern S.A. and even though national parks and reserves cover much of this area, recent surveys suggest that numbers are declining, possibly because of prolonged drought and certainly because of too frequent wildfires. Nearly everybody heads for the same place at Hattah-Kulkyne National Park to see Mallee Emu-wrens; such concentrated activity could eventually lead to an over use problem and result in that area being put off limits. There are other alternatives. Pink Lakes National Park is another reliable place to see them and so are parts of the Sth. Bore Track in Murray-Sunset National Park. In S.A., Ngarkat Conservation Park was always a good place to see them but lately they have been harder to find there. Back at Hattah "township", over the western side of the railway line near the big power line is also worth a look. Some years ago I was lucky enough to find a nest and able to photograph the male and female (there were no helpers) arriving with food, which they did every 10 minutes or so. It must have been a good season because there were lots of migratory woodswallows present. 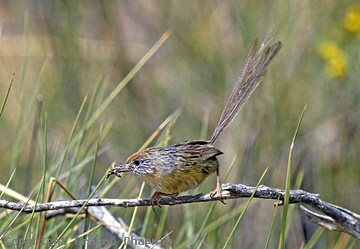 The nest was so well hidden in the centre of a clump of spinifex that it was invisible, even from a few inches away. The centre of a spinifex clump is not just a safe place to nest - the birds themselves also seek refuge there if necessary and only the foolhardy would attempt to follow! 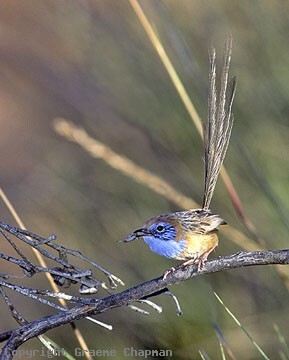 An excellent summary of the status of Mallee Emu-wrens can be found at www.environment.gov.au on their Species Profile and Threats (SPRAT) database. 527201-D ... Mallee Emu-wren, male. See also TOP SHOT #123. 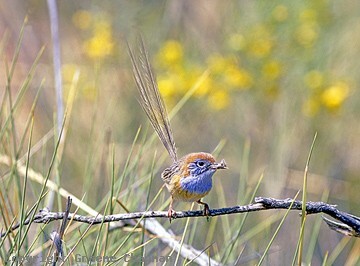 527202 ... Mallee Emu-wren, female. 527204-D ... Mallee Emu-wren, female.